Only one picture today....I did quite a bit today, but was so busy that I didn't stop to take any photos. Today I started the morning by doing Stage 1 of bending the cutaway side bindings. I did these in the same way I bent the cutaway sides: first in the regular Fox-style bender, then in the little bender I made especially for the cutaway horn. So, this morning I bent the bindings in the regular bender. Then, while that was cooling down, I set about fitting the non-cutaway side bindings I had bent yesterday. I needed to make sure the bindings and purflings all fit the channels without gaps. I also needed to trim the ends to length and miter the purflings. I am mitering the side purflings to the end graft purflings, and also am mitering the side purflings to a vertical strip of binding at the neck end. Would you believe it took me at least three hours total to do the fitting and trimming of just the two pieces of binding (the non-cutaway side bindings of the top and back)? But I wanted to be super-careful and really make this look good. I think I'm getting better at this!!! After that was all done, I removed the cutaway bindings from the bender and proceeded to set them in the other bender to bend the cutaway horn. It's sitting there right now, cooling down. Probably later tonight I'll remove them to see how they came out. There's not much more on this soundbox I can do at the moment, until the cutaway bindings are ready to fit to the channels. 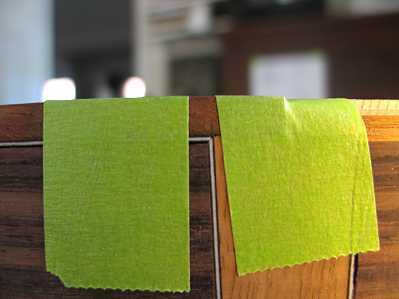 Oh, yeah...I forgot....one other thing I did today was to brush some shellac on the edges of the top, so that when I later glue on the bindings, it will keep glue from soaking into the top and will help prevent grain tearout when I remove the masking tape. This morning I took the newly-bent cutaway bindings out of the bender, and, by golly, they came out much, much better!!! No scorching, no cracking!!! The only thing that was a little problem was that I had one piece of binding that had been compressed in one 1" section on the cutaway horn, so it was a bit too thin there for my liking. That little thinned section of binding worried me, so I set about thinking what to do about that problem! Well, I figured it out....out came my handy-dandy little travel iron and a wet piece of towel to the rescue!!!! 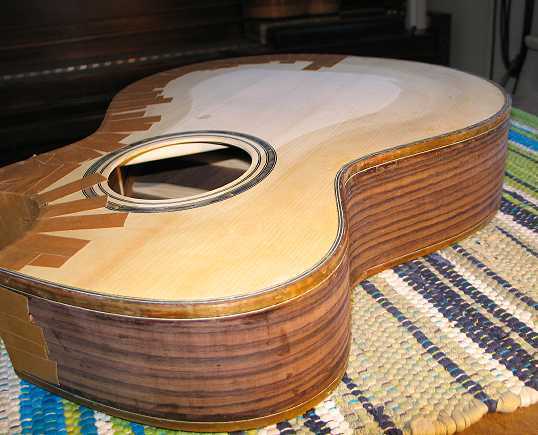 I thought that if the wood was just compressed, steaming it might work to bring it back to its original thickness (because I knew you could do that when you get a little dent in your spruce top, for example). I laid the dampened towel piece on top of that compressed section of binding and ran the tip of the travel iron over it a few times. The wood fibers swelled back to their original size and my binding was saved!!! Yay!!! I was relieved. 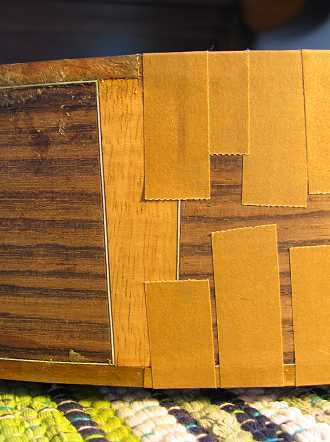 After I dealt with the problem above, I then spent the afternoon fitting the cutaway bindings and purfling and glued them in, completing all the various areas where I had to miter the purflings. I had a little gap at the neck end of the back cutaway binding (at the corner where it meets the non-cutaway binding) — it was weird, because when I did the dry-fitting, everything joined up perfectly — but I guess something shifted in the gluing. But I managed to fix that, too! I made some koa dust, mixed it with epoxy, and dropped the epoxy into the gap. When it cures, I will just scrape it all flush, and, hopefully, it won't be too noticeable. Thank goodness for epoxy, travel irons, and wet towels!!! I think a large part of the building experience (for me, anyway) is figuring out ways to get out of the messes you make for yourself. It's a never-ending journey of problem-solving! So, that's it for today. Right now it's around 5 p.m. My soundbox is now sitting with the cutaway bindings all taped up (I had removed the tape from the non-cutaway bindings yesterday). Tomorrow....we'll see how it all came out, when I scrape it all down.